DAY in Excel (Formula,Examples) | How to Use DAY Function? How to Use DAY Function in Excel? In a restaurant business, if we want to see which day of the week was good earning day for the business or want to find out if there is a trend emerging. Or for a Unisex salon, want to see which day of the month when the most of customers coming in. These kinds of financial analysis can be done easily by using DAY function as it returns the day of a date. Forgetting the day of a month as a number between 1 to 31 from a given date, we use DAY function. 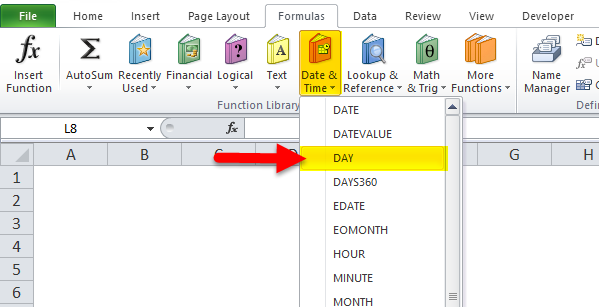 The DAY function is a built-in function in excel and it’s come under Date/Time function category. The DAY function is used to extract a day number from a date into a cell. Date_value/serial_number – A valid excel date with the format of the serial number for returning the day of the month. Select the DAY function from the drop-down list as per below screenshot. This DAY Function is very simple easy to use. 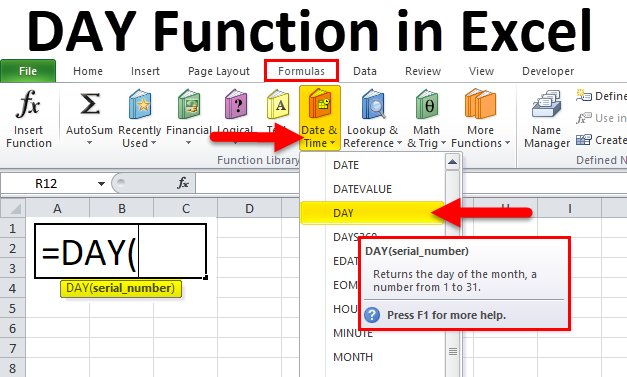 Let us now see how to use the DAY Function in Excel with the help of some examples. We provide the date as arguments as cell references containing dates (in the above example cell A5). Suppose below dates are given and we need to add a given number of years to dates. In these conditions, DAY function is very useful. Suppose we need to find out the first day of the month of given date. For this, we will use DAY function. The DAY function returns the day value for a date here. For cell A24, the day value for the date 11/23/1989 is 23. Excel store the dates as a serial number. So, we can subtract 23 and then add 1 to get the date value for 11/01/1989. We can calculate the number of days in a month for a given date with the help of DAY function. While using the DAY function, it can give the result looks like a date “01/01/1900” instead of an integer. For correcting this, select the General formatting option in excel. From the drop-down format menu, select the ‘Number’ group on the Home tab in excel. In the below image, select the Number option under General Option. How to use Excel LEFT Function?